Joshua Spodek had an Ivy League PhD, an 8-digit valued global company, national-level athletics, studied with a Nobel laureate, had solo NYC gallery art shows, was named “Best and Brightest” by Esquire, six patents, helped build a satellite, and more – but still found himself helpless as his employees chose not to come to work one day to protest how the other co-founder and he were running the business. What good were all these achievements if they just led to an empty office in the midst of the biggest crisis? Joshua says it took years to discover that his lack of humility, emotional skill, social skill, listening, empathy, compassion, self-awareness, and such were the greater problem than running out of money, which was just the symptom. Years later, he gained some insights into what seemed much more important than the business school he’d excelled at. The first came from Inside the Actors Studio, where Joshua saw that all the actors excelled in the social and emotional skills he lacked. Beyond excelling past him, they excelled beyond any MBA or leadership professor. Yet nearly all of them dropped out of school or were kicked out. Second was visiting a Philadelphia high school called Science Leadership Academy (SLA) that his friend founded, that Obama spoke to the first graduating class of. The school was experiential, project-based from the ground up, the opposite of teach-to-the-test. Each time he visited, the students showed leadership and teamwork skills beyond MBAs that he knew. Again, like the actors, they didn’t take classes in leadership or anything like it. Yet these teenagers surpassed Ivy League leadership professors in some of the most important business skills. Joshua took what worked in acting and combined it with what worked at SLA, and the result was a set of courses that produced student results off the charts of traditional education, getting stellar reviews from students at NYU. His courses continue to grow at NYU and Columbia. He offers those same courses, using the same software and exercises, at SpodekAcademy.com. The first book version is out, “Leadership Step by Step,” which launched in February. Joshua’s personal life illustrates the courses’ success. He’s spoken at Harvard, Princeton, MIT, gotten standing ovations, etc. Most importantly, he lives a life of phenomenal relationships, emotional and social confidence and success, and integrity that anyone can achieve and that he teaches. His students learn to create for themselves every success he creates. Some as teenagers, their work for his class has led them to speak at Harvard, be featured in Forbes, Inc., and more, win numerous awards, etc. Their success is the measure of the courses and their success is beyond what traditional academics creates. 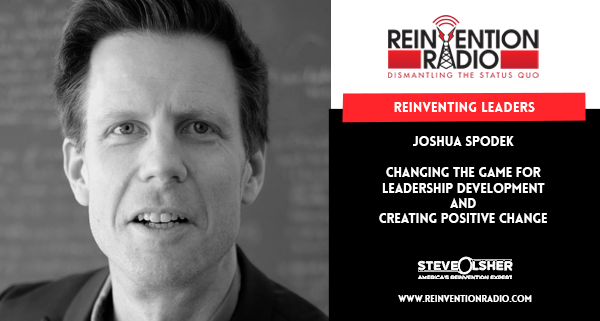 TUNE IN to this episode as Joshua chats with Steve, Mary, and Richard about changing the game for leadership development and creating positive change. 3 – Obama vs Trump leadership style; Trump was more authentic; Watching TED Talks doesn’t cut it… you have to practice; Joshua answers the question of who are the most effective leaders and why? Reinventing the Sales Game – In this episode, Christopher Cumby chats with Steve, Mary, and Richard about the sales game, and how to transform the selling process to make life and business more fun.